Our company has always had the Quality as hallmark and the most important company policy. It represents one of the main pillars of our structure, as it is evidenced by our first quality certificate UNE: ISO in 1994, becoming, at that time, one of the first manufacturers in Europe accredited through this new quality system, completely new and largely unknown to many industries. 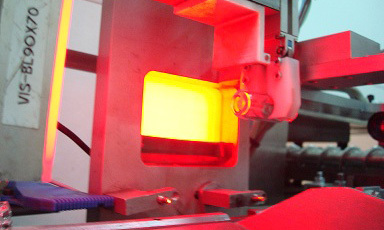 Currently the company has an independent internal department with high qualified personnel supported by innovative Quality and Environmental management systems adapted to our industry and products. 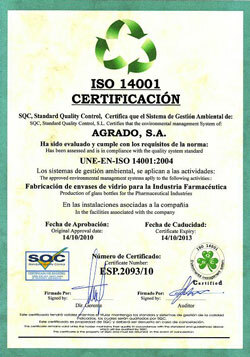 Today, we continue with the same principles of quality, with the UNE-EN-ISO-9001: 2008 and environmental certification UNE-ISO-14001: 2004, as well as certified company in the Industrial Health Record (IHR) of the Community of Madrid for the handling and manufacturing of glass containers. Our company has always been aware of the importance of Quality, and the proof of it is all certificates and accreditations that make AGRADO in a company pioneer and leader. Not only the quality has been one of the important factors in the development of our company, but also the environment has been, and remains, one of our key pillars based on our company's Environmental Policy where we take every internal resources to ensure environmentally-friendly, such as energy saving, rainwater collection for irrigation, recycled glass, cardboard, paper, plastics, packaging, insurance hazardous materials, noise, measurement and assurance agents air pollutants, etc. 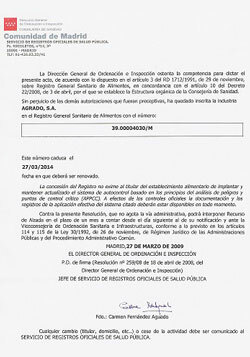 We also have accreditation from Madrid through the Industrial Health Registry number (IHR) for manufacturing and handling vials and ampoules. Our current facilities have got qualified areas controlled and certified ISO-8 Class D, in all areas where vials and ampoules are handled, by validating company Qualipharma. These areas allow us to ensure our final products during the process of handling once they left their tempering process. The air in these areas is properly filtered through equipments and filters HEPA which maintain an optimal level of airborne particles and air recirculation according to current regulations. 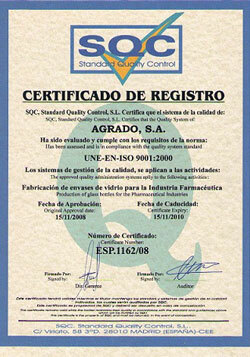 The quality policy of AGRADO S.A. is focused on customer satisfaction. Aware of the importance of quality to guarantee present and future, General Management of the Company declares the Quality as a priority, and wants to make it known to both workers, customers and suppliers. Our most important rating scale for Quality is the satisfaction of our customers. We must continually tend to receive their complete trust in AGRADO S.A. as their supplier. Customer expectations and reached agreements have to be met as agreed, both, with our products and with our actions. The quality has to come expressed in our commitments, actions and products. Each supply has to generate a recommendation from our customers for future business. Likewise, we are committed to continuously improve our business in having all the resources necessary to achieve our goals. To achieve these quality objectives, and thus the company's goal to always be profitable and successful, are involved all technical and human elements of the company. 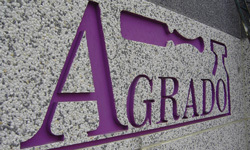 Our quality policy means: The entire organization and full staff members of AGRADO S.A. must act, at all times, so that it is satisfied with what is expected by our customers, our suppliers and the environment in which we live.